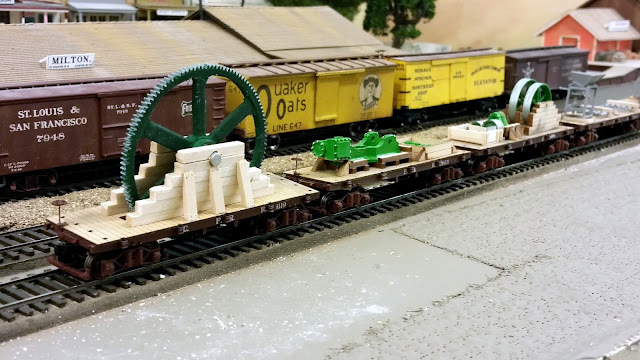 Here are cars carrying a feeder, stamps for a stamp mills, the camshaft for the mill, a retort, crusher and Wilfley table base. The well car with 20-foot gear. The bottom of the gear extends below the car deck, almost to the rails to provide enough clearance for the tunnels. The second car carries a steam engine frame while the third car carried the rest of the engine parts plus its flywheels. 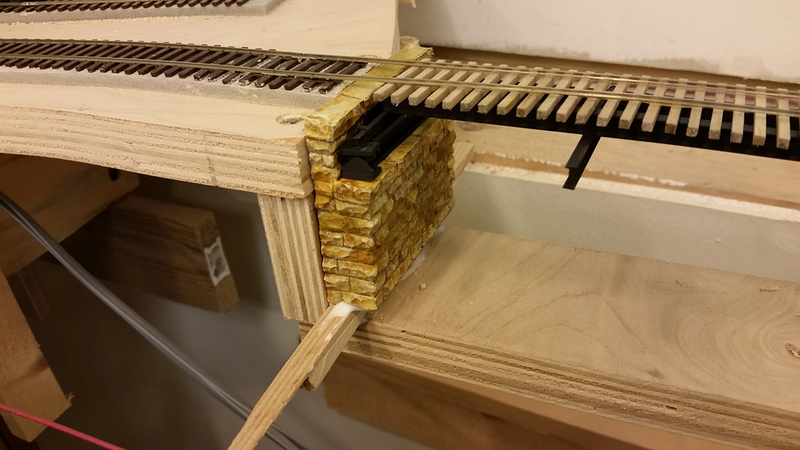 I like loads on flat cars. 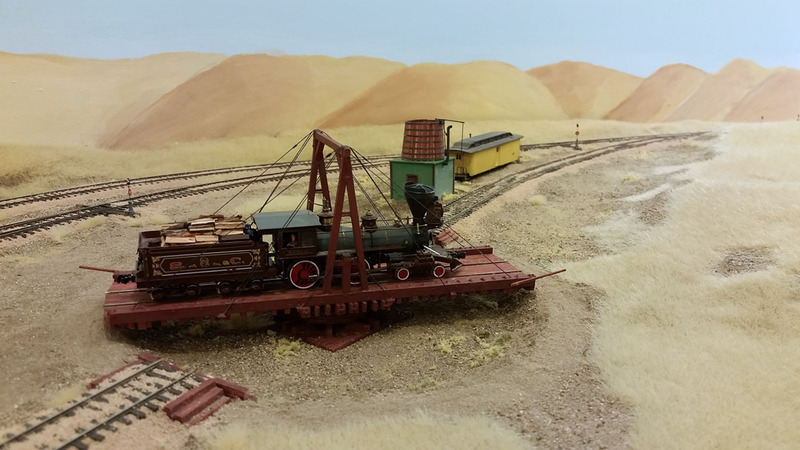 With the railroad bringing goods to the gold rush country, it seems logical that some of this heavy equipment would show up on flat cars on the S&C. 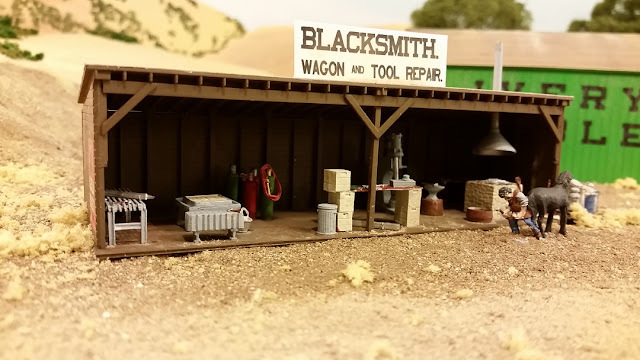 I had an old kit made by Western Scale Models which represented such a load of various types of mining equipment. 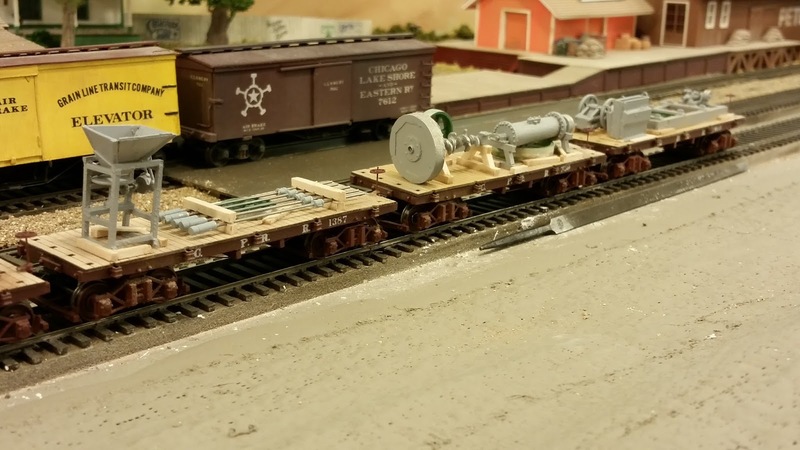 I finally decided to put the thing together and place them on a couple of flat cars. The original plan of the kit maker was that everything would fit on two 40-foot flats. When you're using 30-foot flats, the load takes up three cars. 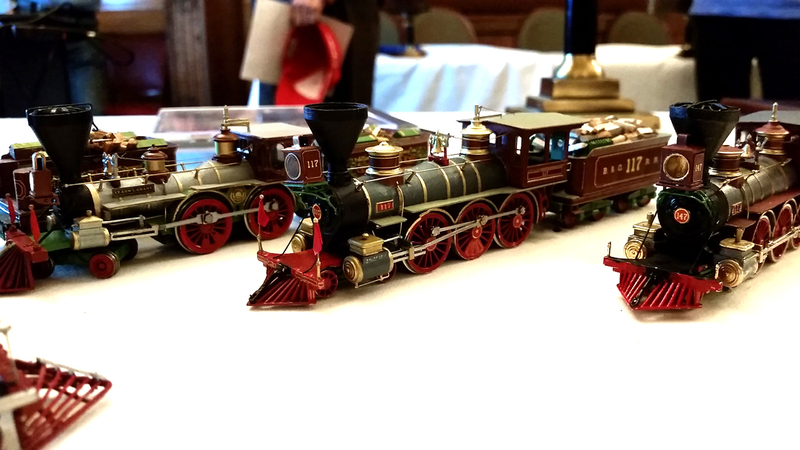 Adding in the steam engine load from American Model Builders increases the train to 5 cars. When I had gotten this far, I realized that I had to build one of my favorite loads, a 20-foot diameter gear on a well car. This particular load was copied from 1875 newspaper articles and an photo of the car. So now we have a six-car train which, due to the gear (which barely clears the tunnel portals), will have to operate very slowly, not exceeding, say, 10 mph. We'll see how that weaves in with the other traffic on the line. 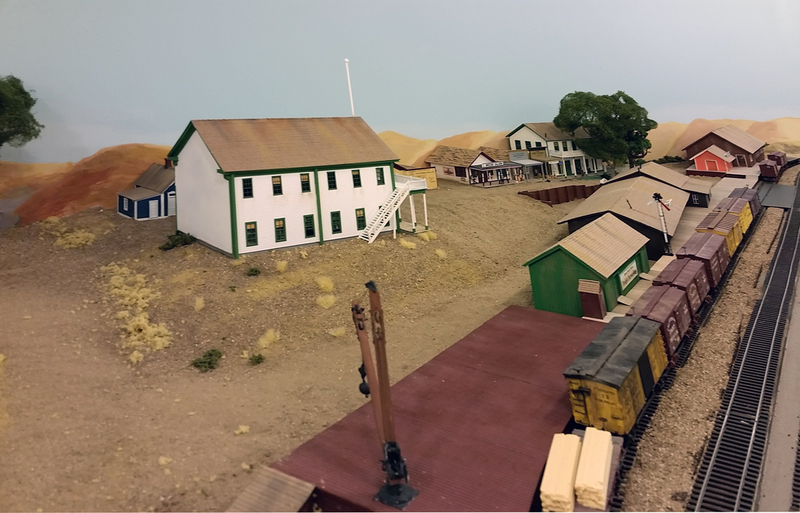 This overview of Milton shows the Tornado Hotel at the left along with a barn which is a stand-in for a livery stable and blacksmith shop to be built. The Masonic Lodge is in the center with the town stretching behind it. 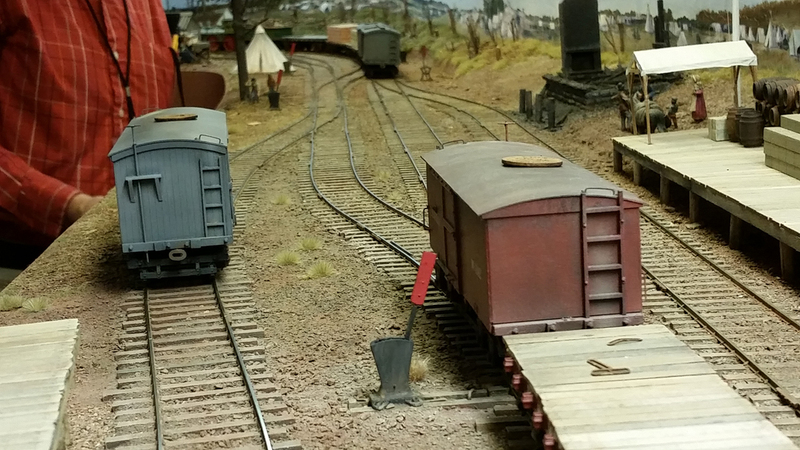 Alongside the tracks are the various warehouses and freight forwarders. A corral will be on this side of the tracks along with a turntable to be at the right just out of the picture. Here is another photo of Milton which I wanted to include in the last post. I think it shows the town in a better view. As I mentioned, I still need a few structures and a turntable to round things out. Looking a Milton from the south, the town is arranged along the east side of the town plaza with the warehouses on the west side. The Masonic Lodge looms over the entire scene. After several months of structure and scenery construction, Milton is starting to look like a town rather than a bare piece of plywood. 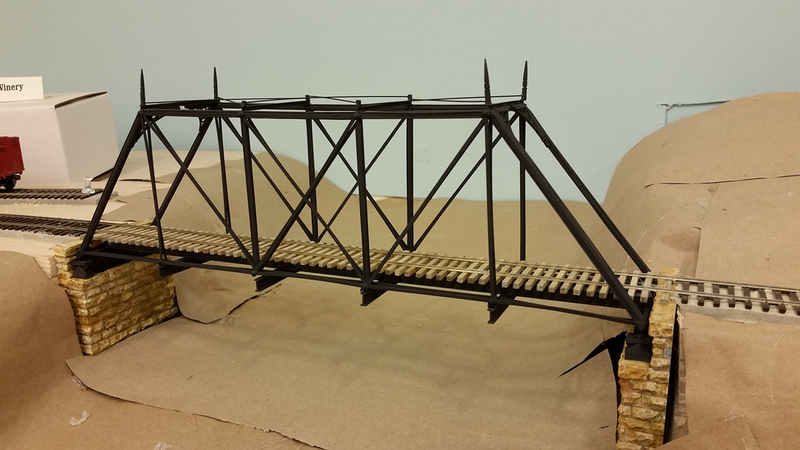 So far, there are 17 structures which have been built, only one of which was from a kit. That was only because I had no pictures of the building and the kit was the right size. Looking north up the main street, the Milton Hotel is on the right with the Peterson & Dake store on the left. 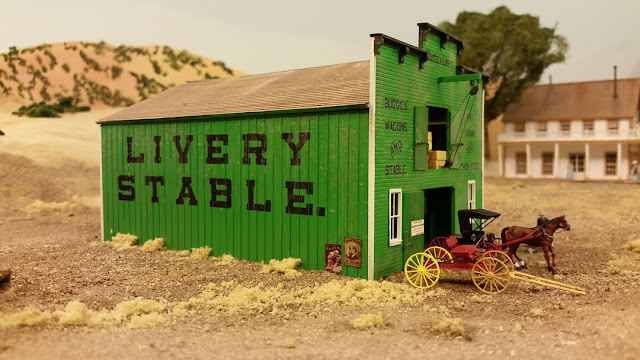 Stores, barber shop, saloons and a livery stable are all present. 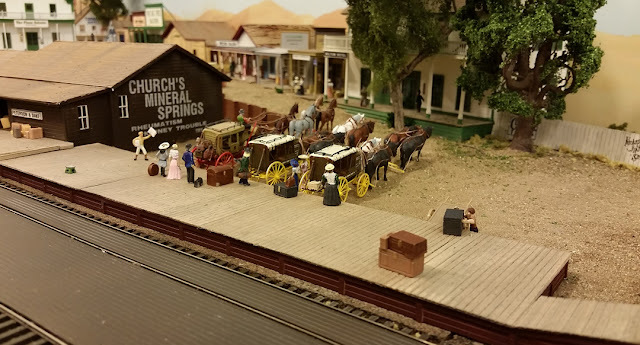 Church's Mineral Springs was a hot springs in the area. It was a challenge to build a whole town to scale but rewarding for me. The only thing out of scale was the depth of the scene looking from the aisle. I just did not have quite enough depth but it isn't real apparent unless you study old pictures or have visited the actual location. The structures were styrene with Grandt or Tichy windows and doors. 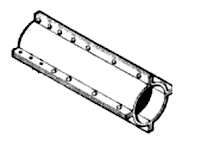 Dimensions were taken from Sanborn insurance maps of the town. Building colors were a little trickier. I had to take educated guesses based on the varying shades of gray from the old photos and compare that with other pictures taken with the blue sensitive film of the day. The names of the establishments were taken either from photos or the town directory of the 1890s. construction hotel on the foundation. The owner finished the building and named it accordingly. 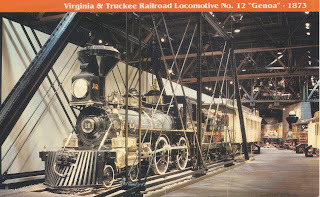 On the prototype, Milton was the end of the line and almost all of the goods traveling to the gold country passed over the rails to end up here. 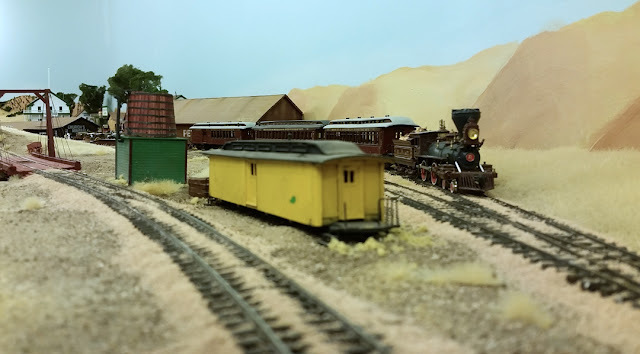 Freight wagons carried the goods to the places like Angel's Camp, San Andreas, Altaville, Sonora, Columbia and Jamestown. The large Masonic hall on the hill was the dominant building in the town and lasted until January 2016 when it burned. It was the last remaining structure in the town which was there when the railroad existed. An overall view of the town looking from the north. 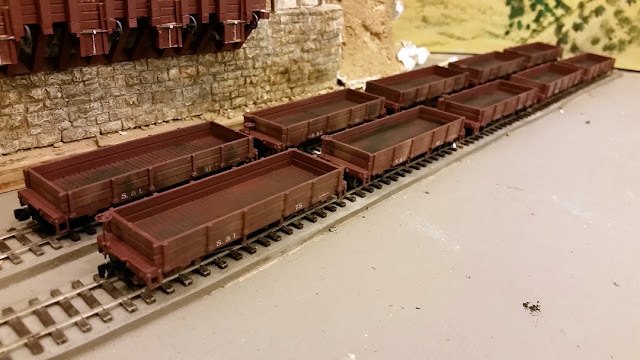 All of the platforms need some "set decoration" and the streets need wagons. 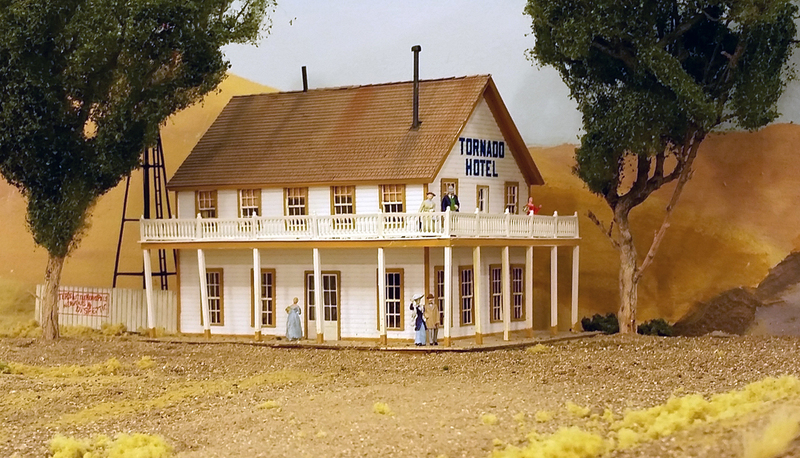 The Tornado Hotel is just out of the picture to the left. 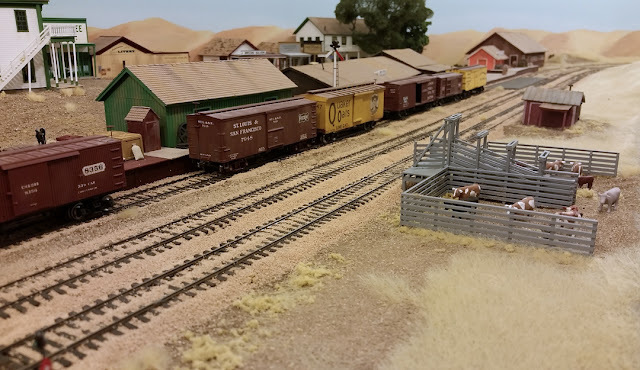 There is still a lot of work to be done to build a turntable, stock pen, livery stable and blacksmith shop as well as stock the loading platforms with goods and the streets with wagons and buggies. 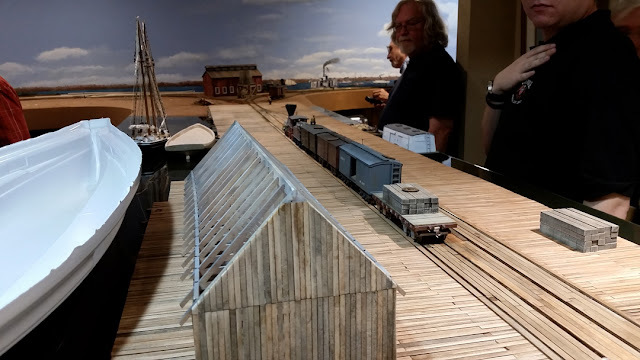 Last week, representatives of the Edison Studios arrived at the offices of the Stockton & Copperopolis with the intention of filming parts of the railroad. Accordingly, a position on the pilot of one our locomotives was arranged and the camera secure thereon. Several hours were spent to produce a film slightly over three minutes in length but it was worth the effort, none of the staff having seen such a presentation. Camera Car B rolls over the Stanislaus River bridge during the filming of the movie above. In reality, the management purchased a Replay Prime X camera with the idea that it could be adapted to model railroad use. I had previously not been impressed with the movies I had seen of other railroads due to two factors. The first was that the camera was aimed so that much of frame was filled with images of the layout lights. 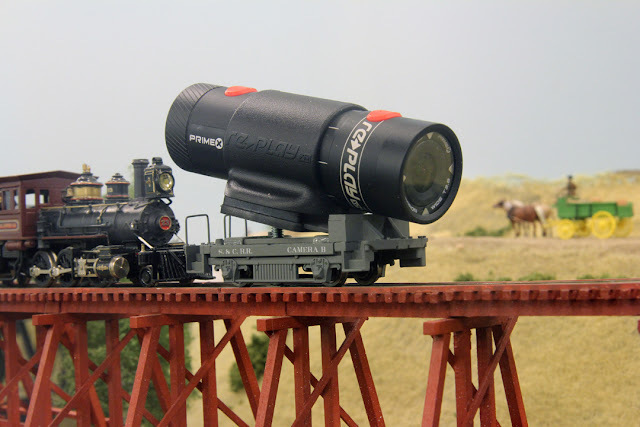 The second was that, on a curve, the camera pointed away from the track rather than looking on it. These problems were solved with the camera car that the S&C shops constructed. The car is built on the chassis of a Mantua 4-wheel bobber caboose. Some blocking was added to the car to hold the camera with a screw to adjust its height. The result can be seen in the short movie which was made just to test the concept, and to familiarize myself with the video editing program I have. More breathtaking movies will undoubtedly follow. 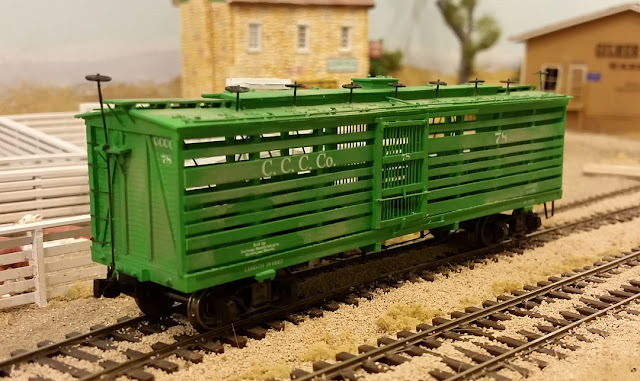 Canda Cattle Car Company stock car 1256 waits at Oakdale along with other CCCC cars.The hatch in the roof is for filling the onboard water tank while the pipes along the roof sides distribute the water to the water trays inside the cars. 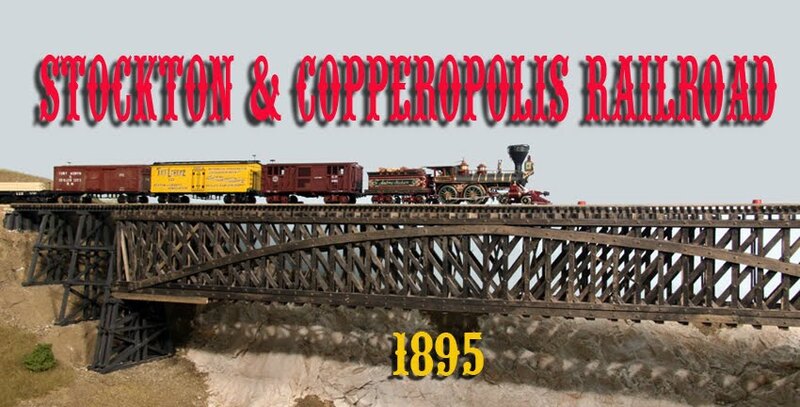 The Stockton & Copperopolis had several stock pens along its route, at Oakdale, Burnett's, Peters and Milton, perhaps a couple more. Up until now, I had no cars with which to service this traffic. Taking a break from Milton scenery, I assembled four Silver Crash Car Works resin kits. 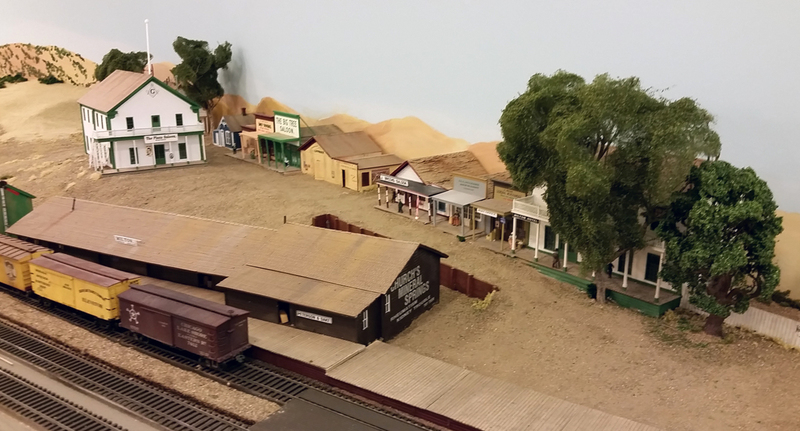 They are models of the 36-foot Canda Cattle Car Company palace stock cars from the 1890s. Palace stock cars were common in this period and contained food and water bins so that cattle could be fed en route without having to stop periodically to let them out of the cars. Several companies developed these cars which were then leased out to the railroads during their stock shipping season. The cars represented here were first displayed at the 1893 Columbian Exposition in Chicago and were used up until about 1910 or so. Builder's photo of a CCCC stock car. These cars were built by the Ensign Manufacturing Works in Huntington West Virginia. 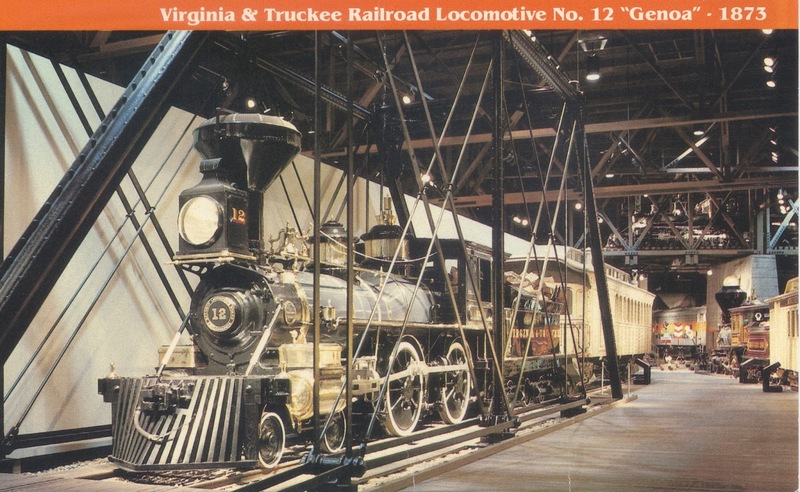 Ensign also built a number of other cars for the Southern Pacific. The builder's photo that I have of this car shows that it is painted a dark color, most likely red or green. 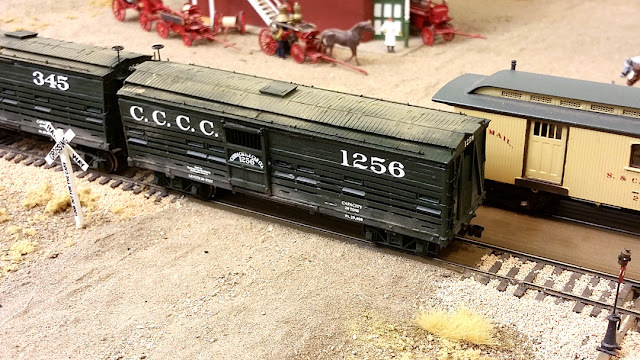 Extensive research did not turn up which color these particular cars were painted so I chose a dark green just so I wouldn't have another four boxcar red cars on the railroad. 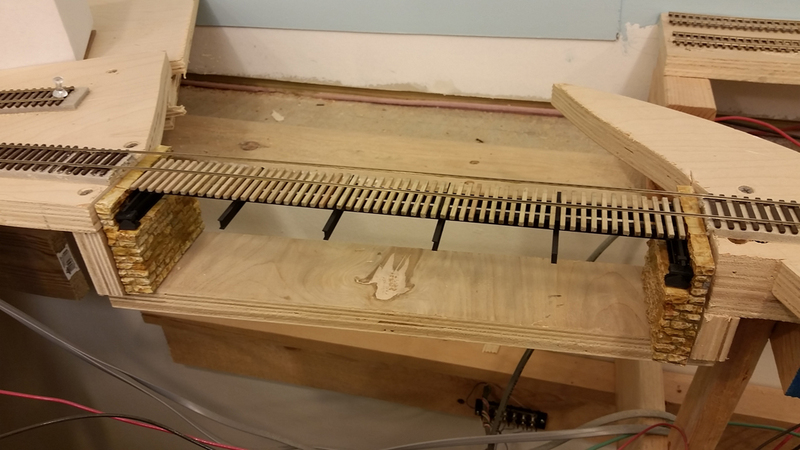 Assembly was fairly straight-forward. The trucks used are Canda trucks as made by Bitter Creek Models which are a fit for these cars. 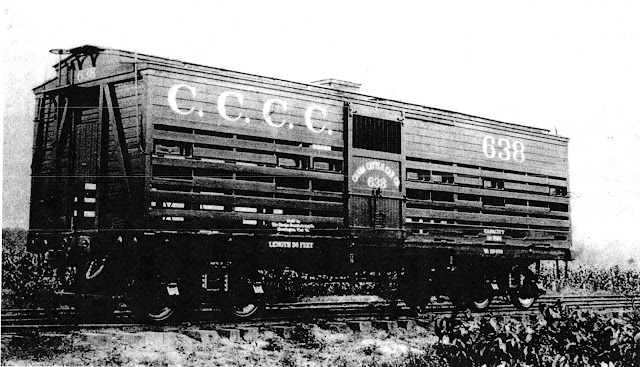 Before 1893, Canda also had an earlier design car which was quite different and was 40 feet long. Also, the Hicks Cattle Car Company and the Streets Western Stable Car Company showed up in this part of the country and models of those will eventually be built as well.